Reboot Congress: Was Peter Kinder a Community Organizer? Was Peter Kinder a Community Organizer? I saw the photo to the right in Jefferson Thomas's twitter feed. 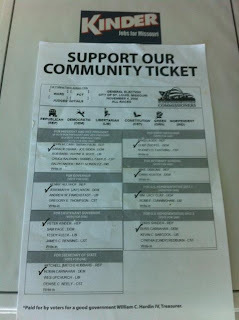 It's a photo of a marked ballot that was paid for by "Voters for Good Government" and distributed to polling places in St. Louis city and county on election day 2008. 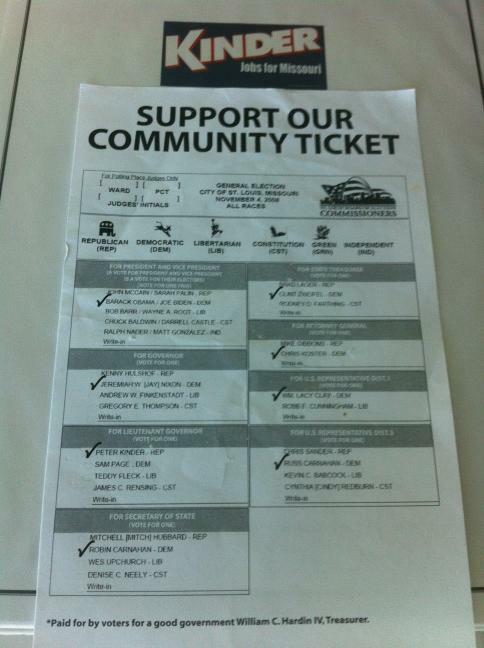 The top screams: "Support our Community Ticket" and Republican Peter Kinder is clearly marked. What's odd is that all of the other candidates that are checked off are Democrats: Barack Obama, Jay Nixon, Robin Carnahan, Clint Zweifel, Lacy Clay, Russ Carnahan, and even Chris Koster who is hated among St. Louis city Democrats. Is that really the company that Kinder keeps? Kinder suffered a series of missteps last year which led him to abandon his gubernatorial bid and try for a third term as Lt. Governor. It would appear that the LG office is a sort of Mendoza Line for Kinder and now it's time for "the coach"--Missouri Republican primary voters--to decide whether they're satisfied with his batting average or whether they should tap someone from their farm team. Fiscal hawk Brad Lager is the guy I think Republicans should put in their lineup. Lager is one of only two Senators during the 2011 regular session to oppose the China hub/aerotropolis bill. I think you can credit Peter's extraordinary outreach to St. Louis city, and to African-Americans in particular. Peter Kinder goes where most Republicans don't. I am not surprised that he picks up endorsements from groups normally hostile to GOP. There's No Spark in the Koster Engine!